Barjarg Rd and Dry Creek planned burns – a vast area to be burnt in a single year. … or is that politics, or perhaps bureaucracy. They all blend in this debate. 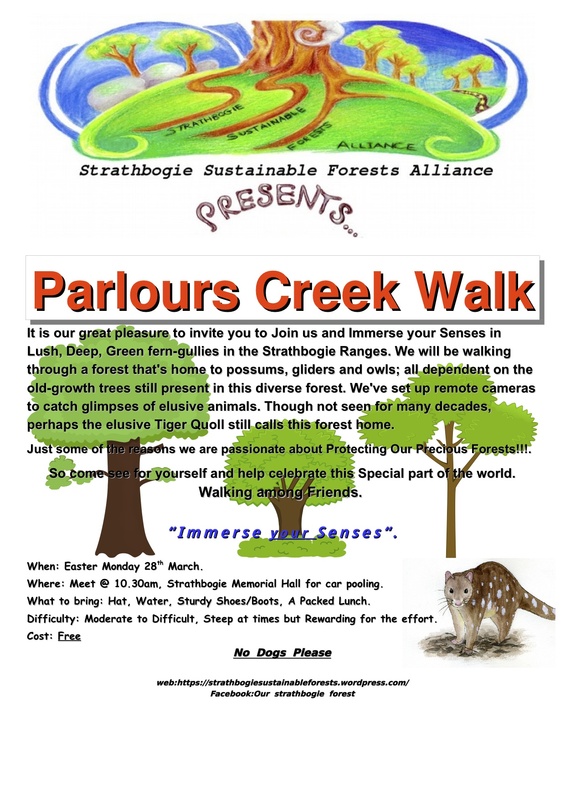 The Parlours Creek block is one part of the 30 sq km Barjarg Rd burn that will go up in smoke in the next few weeks, along with Koalas, Greater Gliders, old-growth trees and other innocent victims of this arrogance. 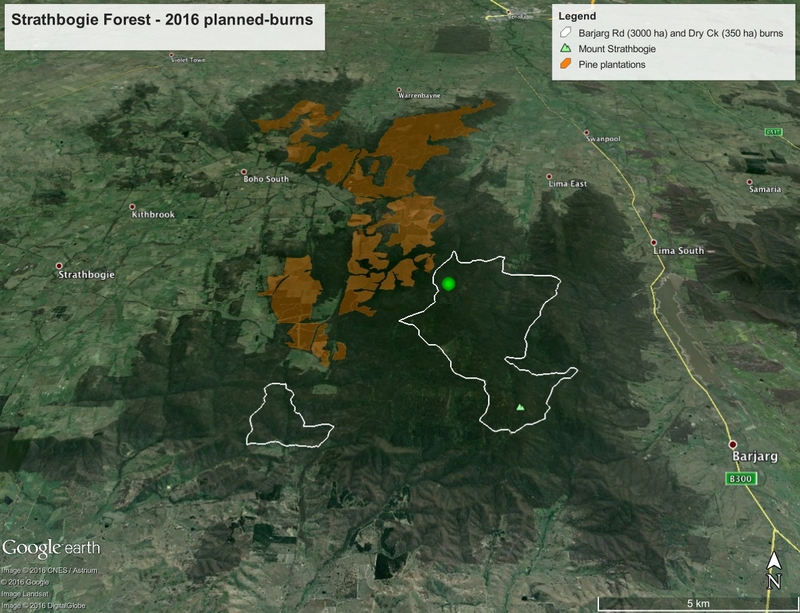 Once burnt, the fuel in the much of the forest will be reduced, perhaps reducing the severity of a bushfire for at least the next couple of years. After that, there may well be an increase in fuels compared to before the fire, as fire stimulates regeneration of disturbance-loving species (like dogwood Cassinia aculeata and wattles). 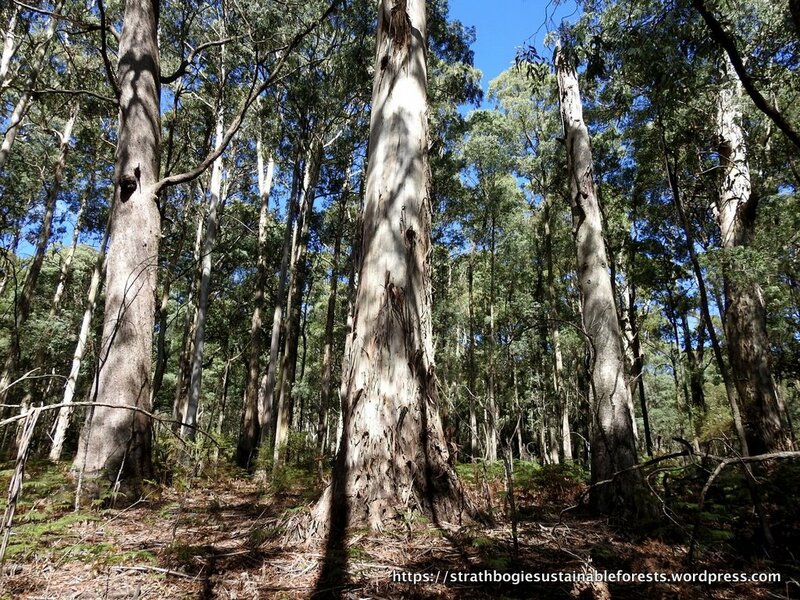 So, what might have been an open shrub-layer beneath towering old-growth Mountain Gums (Eucalyptus dalrympleana) before the fire, could well become a dense tangle of shrubs with elevated fuel loads, for the next 20+ years, beneath charred stumps of former forest giants. The fire may create a few years of reduced risk and a few decades of increased risk – a questionable strategy, really. A group of 45 people ventured into part of Parlours block on Easter Monday, to view first-hand what exactly was at stake. The creek and surrounding slopes are very special, not least because the entire area we walked through was virtually weed-free; not one blackberry! Will it remain so once the burn has opened up the canopy and understorey? This is another one of those pesky little issues that can’t be measured and don’t rate a mention in the Fire Operations Plan. Enjoy the pics – click to view the slide show. We park our cars and the walk begins. The Dogwood shrubs in this pic usually grow in response to disturbance, like fire, storm damage or logging. Descending the slope we head towards Parlours Creek. The creek is shrouded in tree ferns and dense undergrowth. This is a beautiful, mysterious place that fire should never enter. Parlours Creek was still running, despite the long, hot, dry summer. The creek tumbles over boulders and under fallen trees. At times the walk was a scramble, but well worth it for young and old(er). Colour, texture and the sound of trickling water. Crystal clear water bubbling over a sandy creek-bed. With a history of selective logging, parts of this forest are still young, making the old-growth trees even more precious. Much of this forest is open, with low fuel loads and poses minimal fire risk. Note the huge build-up of leaf litter and fine fuels (not). This area has some history of fire, though probably several decades ago, perahps associated with timber cutting in the 1960s and ’70s. We end our walk with a conversation about how precious this forest is. One of the reasons for the walk was to retrieve six trail cameras that had been out in the block for two weeks, to see what sorts of animals frequent this bush. Those results coming soon. This 3000 ha of forest is being sacrificed for an obsolete target. Oh yeah, and we’re coming off a long, hot Summer – It’s just way too dry! That’s No. 7. How many more reasons do we need, to convince the Government and DELWP that burning 3000 ha in one year is folly?